Favourite Flower- It changes constantly, but I do love white avalanche roses, they just look so perfect! Favourite job- I do enjoy wedding work, but funeral work, especially basing chrysanthemums is so relaxing, could happily spend hours making the design perfect! In my spare time - I love my Sundays, i work 6 days so Sundays are my me time! Its usually spent exploring new parts of Devon and Cornwall with my partner and the dogs! After gaining good GCSEs and A levels, i went on to study Floristry at Shuttleworth college in Bedfordshire. I studied full time for a level two national certificate which i passed with distinction. As well as studying for my course, I worked part time in several retail and hospitality positions. From these jobs I learnt many skills, especially the understanding of how important customer service is and the best way to going about providing quality service. I soon found myself working in a busy Cambridge florist, everyday acquiring new skills. Within six months I was asked to move to a nearby branch and manage the business. This is where my passion for floristry developed. Within 2 years I began to feel like I wanted to branch out on my own and start a new adventure. This is when Lily Lovedays was born. 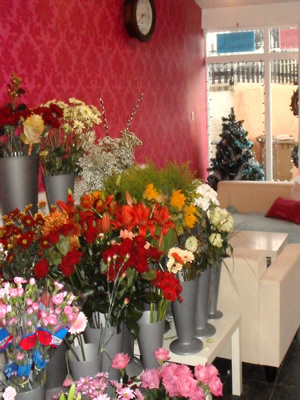 With my brother and sister already living in Plymouth I decided to move and open my own florist shop. My aim was to create a stylish and friendly service that created stunning bouquets,wedding flowers and funeral tributes at a reasonable price and with great customer service too. I have a passion for flowers and love experimenting with new ideas. I relish a challenge, especially where I can create something different and exciting. Every product that is sent out from the shop is made by myself. This means I know that every piece that leaves the shop is at the highest of standards, and is something that I would be happy to receive myself. I believe that the key to any successful shopping trip, no matter what your buying, is the customer service you receive. This is why at Lily Lovedays I make sure customer service is always 5 star. I like to think I give all my customers my full attention. I am always on hand to offer advice or ideas, and i'm happy to go above and beyond to make sure each and every customer has an easy and pleasant experience with us. Im regularly told how friendly and relaxed the shop is. We have many people pop in to say hello, whether it's to me or our resident dogs Herbie and Billy, once our guests sit down they usually tell me they feel to relaxed to leave!